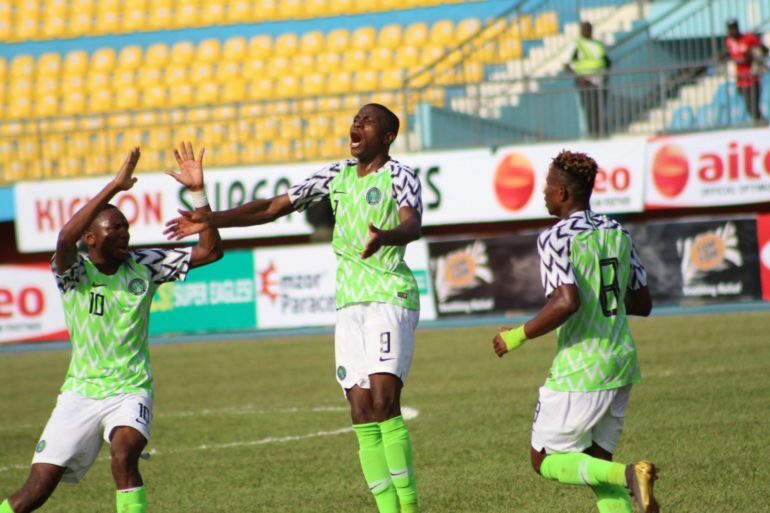 The national under 23 team of Nigeria restored hope the 2019 African championship with a 4-0 win over Libya on Monday. The Libyans defeated Nigeria 2-0 at home and needed just a draw to topple the Imama Amakpakabo boys. A hat-trick from Victor Osimhen and one from Uche Okereke sealed a 4-2 aggregate win for the Olympic team and a spot in the U-23 Africa Cup of Nations. Nigeria needed the win at all cost and fired from every side at the blast of the whistle. Kelechi Nwakali was first to test the posts in the fifth minute but blew the shot just inches wide. Awoniyi also came close to an open lead before the Victor Osimhen’s goal opener to close the first half 1-0. His third of the game came in the 82nd minute. Okereke made it four for Nigeria through an assist from Osimhen, with a brisk back heel pass at additional time to send the Asaba fans to wild jubilation.